The Palm House Phuket, Thalang. New fully furnished 3 bedroom, 3 bathroom property ideal location for families. The Palm House Phuket is a detached holiday home set in Thalang, Phuket. It is located 950 m from the “Heroines Monument”, in a private gated estate with 24-hour security. 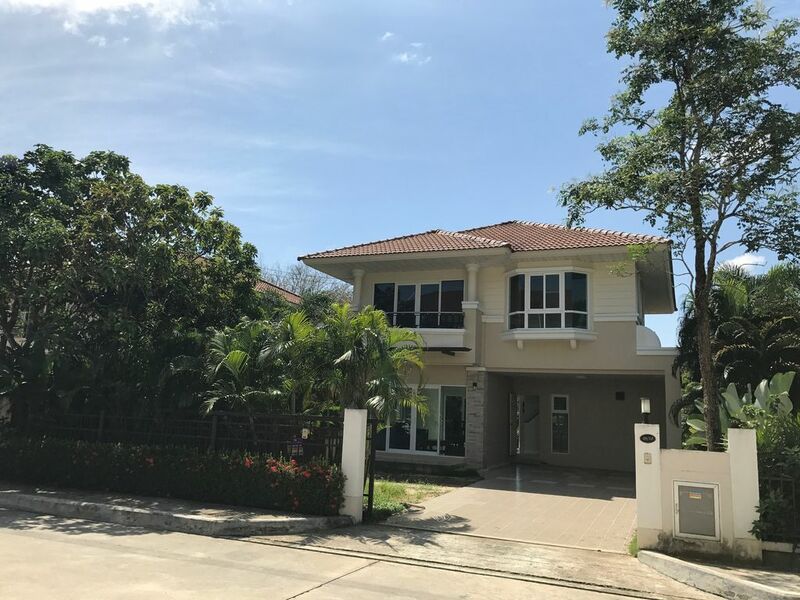 Due to its central location the house has good road access to shopping centers, hospitals, schools and the rest of Phuket Island in general. The many beaches, Temples and other places of interest are all within easy driving distance. The Phuket International Airport is only 15 km from the Palm House. The house comprises of a comfortable lounge area with flat screen TV, DVD player and UBC cable, a good sized dining area, large fitted kitchen, store room and shower room on the lower floor and a master bedroom with on-suite shower room, flat screen TV and UBC cable, a second bedroom with double bed, third bedroom with twin beds and separate shower room on the top floor. Other facilities at The Palm House include, an outdoor seating area with table and chairs, barbecue, washing machine, free WIFI and car parking etc. There is a children’s play area on the estate grounds. The Palm House Phuket also provides two complete sets of golf clubs (complimentary) for guests to enjoy a round at either the Blue Canyon Country Club, Mission Hills Golf Club, Loch Palm Golf Club, or Red Mountain Golf Club. Within walking distance from the Palm House are several authentic Thai food restaurants, a convenience store, laundry and pharmacy. With an easy 10-minute drive to the “Laguna” area, Spas, Coffee Shops, Super Markets and large number of Restaurants and fine dining options can be found at the “Boat Avenue”. For athletic guests, Wake Boarding, Wall Climbing, Mountain Bike Riding and a Public Swimming Pool etc. are also available in the same area. Car hire, day trips and sightseeing tours etc. can all be arranged on request. Airport transfers to and from the property are easily arranged for a small fee. Request during booking required please. Monthly and long term rent/rates are available, please enquire as necessary. As a family we have visited Phuket for many years and have family living there now close to the Palm House. We use the property as a family holiday home but also want other people to be able to stay in a home from home and enjoy everything in this amazing place. We decided on this property because of its location. It is ideally positioned on the Island to allow easy access to all of Phuket, especially the beaches but also if people wish to explore further afield. Driving north away from Phuket, the Phang Nga province is easily reached and also the Khao Sok national park. Bathroom 3, located on ground floor. Secure parking in front of property. The living room has a large sofa, and bean bags. There is a flat screen TV with cable channels and a DVD player. Extensive range of dishes and utensils. Fully fitted modern design kitchen. Open dining area with table to seat 6 people. The front and rear garden are both safe and secure for children. Two full sets of modern golf clubs available to use. Free of charge. Collection from the airport can be arranged and a family SUV/Car is available to rent from the property.Day trips and luxury boat charter can also be arranged on site. Advanced notice required for boat charter. The Palm House is very close to the Anthem Wake Park and Climbing Wall. There is also an Aqua Zone on the lake. Some of the finest beaches in Phuket are all within a short drive. There are also some of the best golf courses close to the property. Car hire, boat charter and day trips can all be arranged at the property. The Boat Avenue is a great place to visit with plenty of bars,restaurants, and coffee shops as well as a supermarket and a night market on selected day's. Tesco Lotus, Makro are also close to The Palm House. The Boat Lagoon Marina and the Royal Phuket Marina are less than 5 kilometers away. To the rear of the property,on the private estate, a children's play area can be found and a relaxing park area. The Kathu Mining Museum and Khao Phra Thaeo National Park are both less than 4 kilometers away.